Kristin Hardin is a fixture on the West Coast circuit, making waves with her winning streaks, her decorative tack, and her flying ponytail. In the past few years, Hardin and her longtime partner Bert made a name for themselves as a pair, claiming victory in nine grand prix classes over the course of the 2014 and 2015 seasons. And although Bert firmly remains Hardin’s “heart horse,” another one of Hardin’s mounts is rising as her next star. 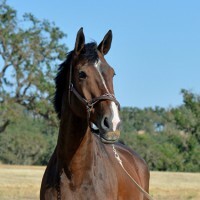 Firestone S (Querlybet Hero—Chloe-S, Goodtimes), an 11-year-old Dutch Warmblood gelding, came to Hardin in May 2014. Firestone’s former owner, Nicole Teague, was referred to Hardin through a friend in Canada. And after a year in Hardin’s barn, Firestone began to find his winning ways, with his first major grand prix win in the $40,000 Equine Insurance Grand Prix at the HMI Equestrian Classic in July 2015. Recently, Nicolette Hirt has bought Firestone S.
This year looks to be the horse’s breakout season with consistent, top placings in grand prix classes that include a win in a $25,000 SmartPak Grand Prix at HITS Thermal and seventh place in the AIG $1 Million Grand Prix (Calif.). On the road for the majority of the year at competitions, Firestone has continued to build his confidence and momentum, while Hardin has seemingly mastered the art of keeping her grand prix mount happy on the road. Firestone is definitely allowed to get dirty! Hardin knew he was a character from the moment she met him. He’s a lot to manage and a lot to lead. He likes to play and to rear, but he’s much quieter to ride than Hardin was expecting when she first saw him. While at shows, Hardin makes sure to let Firestone get out and express himself. Here, Gerry Campos is holding onto him as he gets playful. Firestone is allowed to express himself in Hardin’s program, which includes going out to roll and play with Bert in lunging areas on showgrounds. “The two of them go out together, roll together, play as much as possible, bite each other, scratch each other,” said Hardin. At home he lives in a big paddock with extremely high fences because he jumps out of anything at a blink of an eye. He’s best friends with Bert. They always ship together, go out and roll in the mornings together, and are next to each other at horse shows. At home, they can see each other, but they can’t touch each other. Firestone (left) and Bert say hello as Gerry Campos and Kristin Hardin get ready to take them out to play. Firestone doesn’t really jump at home and goes on the Eurociser twice a day. Hardin also hacks him a little bit at home, but he’s not one for trail riding. “Trail riding him wouldn’t be very safe, but he lives outside at home and moves around a lot,” Hardin explained. At horse shows, on the days he’s not showing, he goes out for a long trot. He’s very friendly, extremely intelligent, very busy, and very mouthy—not to be mean but to be playful, like a giant dog, according to Hardin. Firestone eats Platinum Performance’s Equine Bar two times per day. He also eats alfalfa and oat hay and gets a bran mash every night. “I monitor how much they drink because once they eat a bar, they tend to go drink water,” Hardin said. Hardin rides Firestone in a Western bit, a correction bit that her husband used for roping. Her husband, Cole, is also the farrier and the welder. Firestone’s bridle is pieced together from various leather parts that Hardin has collected along the way, with a browband made by Freedman’s, Martha Stewart’s choice for harnesses and tack for her Friesians. He wears elastic wraps when he jumps. Otherwise, he doesn’t wear any kind of bandages at night. And he’s rarely ever put in a blanket. Firestone’s biggest quirk is bucking when he’s jumped a clean round, which prompts Hardin to choose to dismount pretty quickly. She also prefers to get a leg up onto him inside the ring. Hardin sees the potential in Firestone to be a championship horse. But she’s also not one to think too far ahead. “I take everything one day at a time because we always have to see how they’re doing before you have any plans,” Hardin said. “We’ll target some bigger classes here and there. It’s still only his second year doing grand prix classes so he’s still pretty green. I want to keep his confidence up and not get greedy. Firestone and Bert at play.